due to the chillies added or it can be made into a milder version, if you are not as heavy handed as I was with my chilli’s…. in fact I think I mistakenly used Habanero’s and not the Thai chilli’s. Needless to say, big learning on what not to do! Credit for this recipe goes to the ‘Real Meal Revolution Cookbook’. Details about this cookbook can be found via my ‘books/links’ section. 1 thai chill deseeded and chopped finely (here I added Habanero….big mistake, unless you like your dish really spicy! )….adding cut chill was not part of the recipe, but I thought what the hell, it didn’t feel hot enough….hmmm! Combine the soy sauce, rice wine, sesame oil, oyster sauce, chilli/garlic paste, spring onions, water and peppercorns in a dish and mix. Add a few drops of sesame oil into the frying pan or wok. Seal the chicken off on the high heat, until it’s a good brown color. Add the sauce and cook until done. If you want the sauce stickier, remove the chicken when cooked and cook the sauce further over a high heat until it’s reduced, add the chicken back & mix. Add the nuts, just before serving. This is great either as a topping over cauli-rice OR put into a vegetable stir-fry. Another option, besides chicken is making a fish or fish & chicken combo. 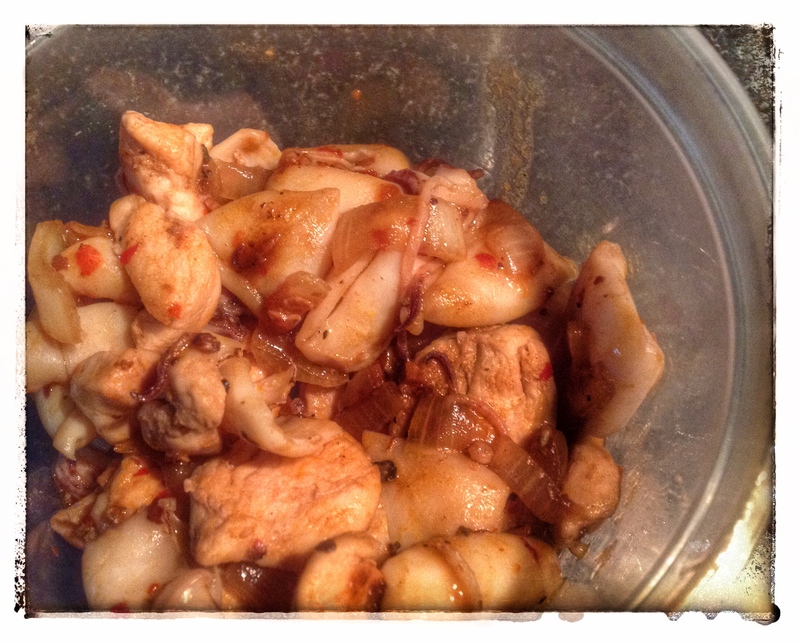 In this case, I mixed calamari tubes & squid heads with chicken pieces, when making the dish. I absolutely adored this! 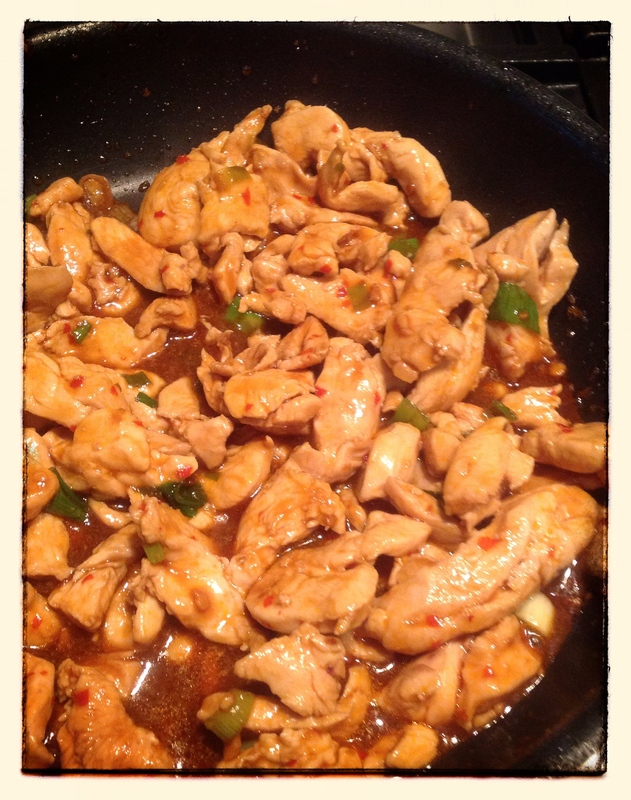 This entry was posted in LCHF recipes and tagged Atkins, banting, chill & garlic paste, kung pao chicken, lchf chicken dish, low carb chicken, low carb fish, low carb high fat, oyster sauce, paleo, rice wine, sesame oil, soy sauce by angelb38. Bookmark the permalink.